Reservations of 25 or more consecutive nights require hotel approval. 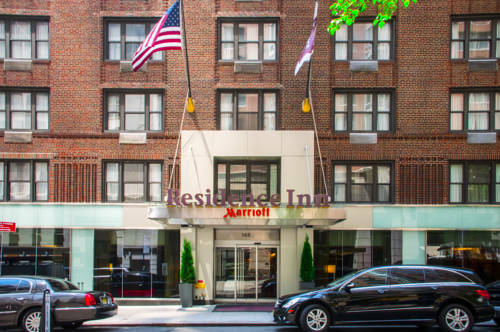 Set a pace that suits you at the new Residence Inn by Marriott in Manhattan. Feel the pulse of New York City in our Midtown East location on East 48th Street close to Grand Central Station, United Nations, and Rockefeller Center. Whether you're with us for a few days or a few weeks, your daily routine matters. You'll thrive at Residence Inn with the conveniences you need, like spacious studio and one-bedroom suites with separate living and sleeping areas and a select few with outdoor space. A kitchenette ready for your favorite cuisine. Complimentary grocery delivery service to fill your refrigerator. Flat Screen LED televisions and Free Internet for connecting to work and the outside world. Free hot breakfast to energize your mornings, and a fitness center for strengthening your body. Add in over 1,300 square feet of meeting space. Small individual pet allowed for a non-refundable fee. Parcel/Package receiving fee applies.